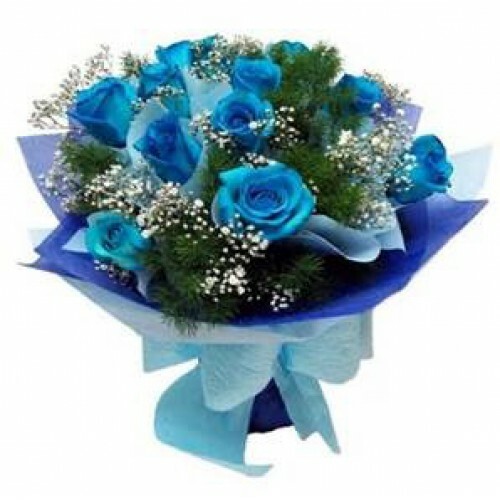 An Aqua hand tied of stunning Blue Roses. We recommend this item as it makes us use our floristry skills and is easy for the recipient as they don't have to do anything to the item. Arrives in floral foam for freshness and just needs topping up with water. Flower food sachets provided our water into centre of bouquet slowly. 12 Blue Roses with foliage and gyp. Both the gyp and foliage work really well to show off these amazing Roses. The Extra Options available will increase the size of the bouquet by adding extra gift wrapping, Larger choice foliage and more gyp.